KINAFORUM: Could an ancient Greek have predicted a US-China conflict? Not so long ago, China's rise was seen as essentially benign. A growing economy, it was thought, would go hand-in-hand with a liberalising political system. China was, to use the phrase favoured by US experts, becoming a responsible global stakeholder. But today China is increasingly viewed as a threat. Indeed, many fear that rivalry between China and the US could ultimately even lead to war, a conflict with global ramifications. Prof Graham Allison, of Harvard University's Belfer Center, is one of the US's leading scholars of international relations. 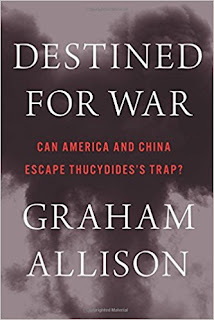 His groundbreaking book - Destined For War: Can America and China Avoid Thucydides Trap? - has become required reading for many policymakers, academics and journalists. Thucydides's trap, he told me, is the dangerous dynamic that occurs when a rising power threatens to displace an established power.